SAN DIEGO - Club Tijuana Xoloitzcuintles participates in the 2015 Soccerloco Surf Cup in Del Mar, Calif. The Xoloitzcuintles had three youth teams compete in the national tournament. The Under-15 squad participated in the exhibition portion of the tournament last week while the Under 12 and Under 13 competed in the Surf Super Cup brackets. It was the third summer Club Tijuana included teams in the nationally renowned tournament that includes hundreds of teams from the United States and other countries. The Xoloitzcuintles won the Under-15 and Under-16 titles last summer. This time, the Xoloitzcuintles took younger squads. The Under-12 squad from the Tijuana Youth System made its debut the competition with a 1-1 draw against Heat FC from Las Vegas, Nevada. Carlos Galicia scored the Xoloitzcuintles goal in the first half, which had the Club Tijuana squad leading at the halftime break. Galicia threw his body through the air for a diving header after Emiliano ‘Piraña’ Ayala had found the space to send in a cross from the left wing. The ball blasted out of Galicia’s forehead and into the back of the net to give the Club Tijuana boys the 1-0 lead. Heat FC kicked off the second half very aggressive looking for an equalizing goal. It found it within the first five minutes to bring the score level at one goal each. The Las Vegas squad took advantage of the second half momentum and pushed the Xoloitzcuintles back deep into its own field. Tijuana was able to deal with the opposition’s pressure and start to push forward, evening out the rhythm of the match. Xoloitzcuintles goalkeeper Julian Mariscal came up big for his team in what would end up being the last play of the match before the final whistle. Heat FC midfielder kicked the ball up the field from midfield looking to play the ball into the box. The ball looked like sailing over Mariscal’s head and into the far top corner. But the goalkeeper tracked back, jumped up high and with a hand over his head in mid-air was able to prevent the ball from going in. The rebound landed to a Heat FC forward who shot the ball first time forcing Mariscal to make a second consecutive spectacular save from the ground to save the point for Club Tijuana. 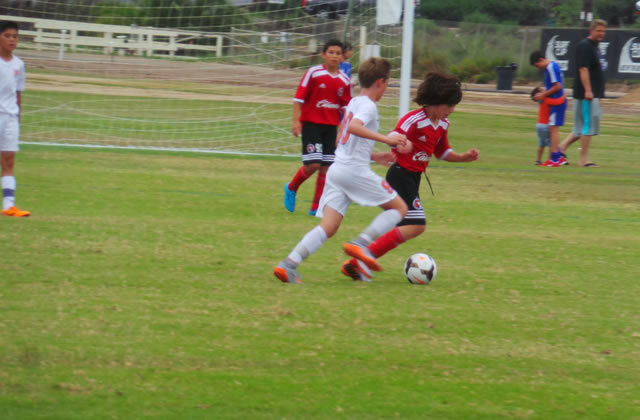 The Under-12 went on to win its second match, a 2-0 outing against Pateadores of Irvine. It finished its bracket with a 2-2 draw against West Coast FC. That sent the Xoloitzcuintles to the playoffs where it lost 1-0 to Albion FC. The Under-13 finished its bracket with a 1-1 tie against Pateadores, a 4-0 win against Seattle United and a 2-1 loss to Fullerton Rangers. They were exhibition games but the Under-15 category played with intensity the weekend of July 25 through July 27. Club Tijuana opened its bracket with a 3-0 win against Davis Legacy. It tied 1-1 against West Coast FC in its second match and finished play with a scoreless draw against Los Angeles United Futbol Academy.